I love a good dessert. Especially one that involves chocolate. Don’t even get me started on dessert involving fruit – they don’t count as dessert in my book. At any rate, this dessert is one of my favorite. I’ve recently been making this one at my pressure cooking classes. One of the things that often gets overlooked with pressure cooking is dessert. 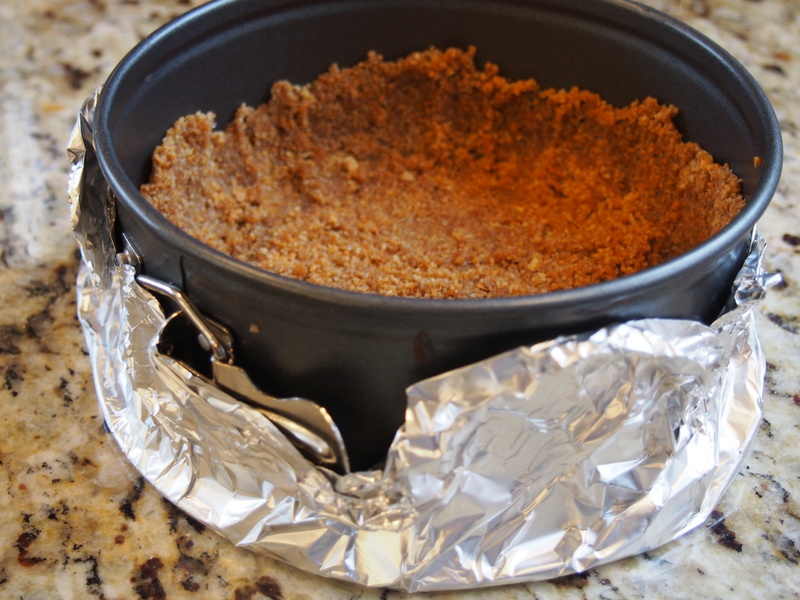 And cheesecakes are especially fabulous in the pressure cooker. If you’ve ever made a cheesecake the traditional way, you’ve probably baked your cake in a water bath. There are no water baths in pressure cooking, but your cheesecake will never have a crack in it or dry out when it’s pressure cooked. So let’s get started. The first trick of a great cheesecake is making a great crust. Not hard. Just important. 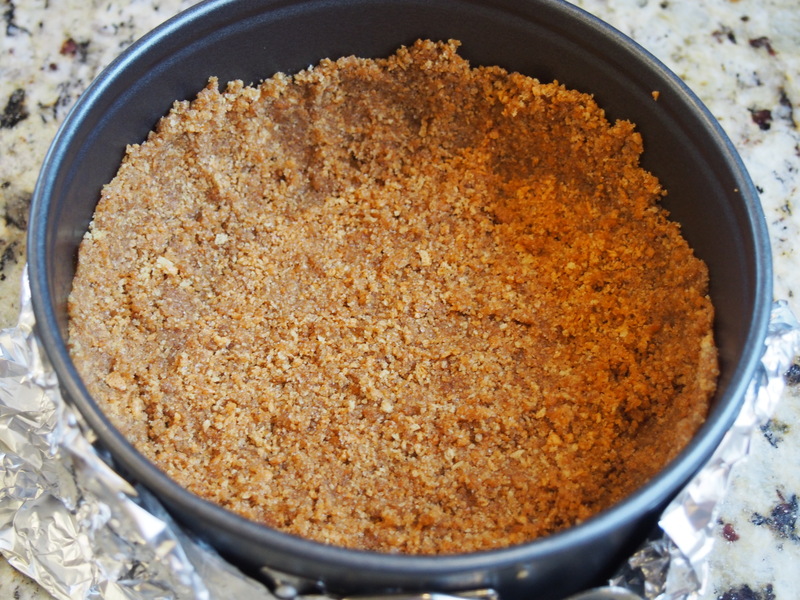 I used graham cracker crumbs in this recipe. If you want to step up the chocolate factor, you can use chocolate cookies instead – use a crispy cookie. To get a good a crust, you need a fine cracker crumb. 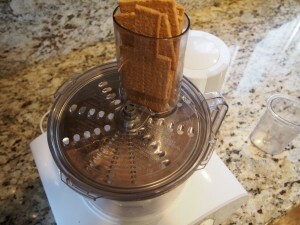 The best trick I’ve found for this is to use the grater blade on your mixer or food processor. If you don’t have a grater blade, you can crumble the graham crackers into a plastic Ziploc baggie and roll it with a rolling pin until the crumbs are evenly crushed. I like to add a little sugar and cinnamon to the crumbs and then mix with some melted butter. 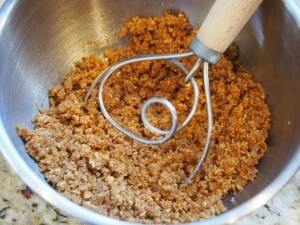 By they way, I love the dough whisk shown in the photo. It’s a really nice cross between a spoon and a whisk. Once you have the crust mixed together, just pat it into your cheesecake pan. I use a 7-inch round, 3-inch deep, springform pan for this recipe. The smaller diameter springform is not a standard size pan, but a larger diameter won’t fit into most pressure cookers. You don’t need a springform pan for this recipe. Just use any bowl or dish that fits in your cooker and holds the batter. I’ve made this recipe with a 7-inch size Pyrex dish and it worked perfectly. 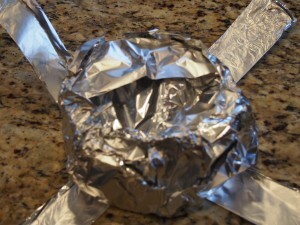 Wrap the bottom of the springform pan in aluminum foil to keep the steam off the crust. This is important. Let me say it again – wrap the pan tightly with aluminum foil. You won’t need to do this if you are using a different sort of container. After making the crust, I like to pop it into the freezer while I’m making the cheesecake batter. I like to think this helps make a crispier crust, but I’m honestly not sure it really makes a difference. Now it’s time to start on the fun part – the cheesecake batter. It’s important that the cream cheese and the eggs are at room temperature, which takes a couple of hours. 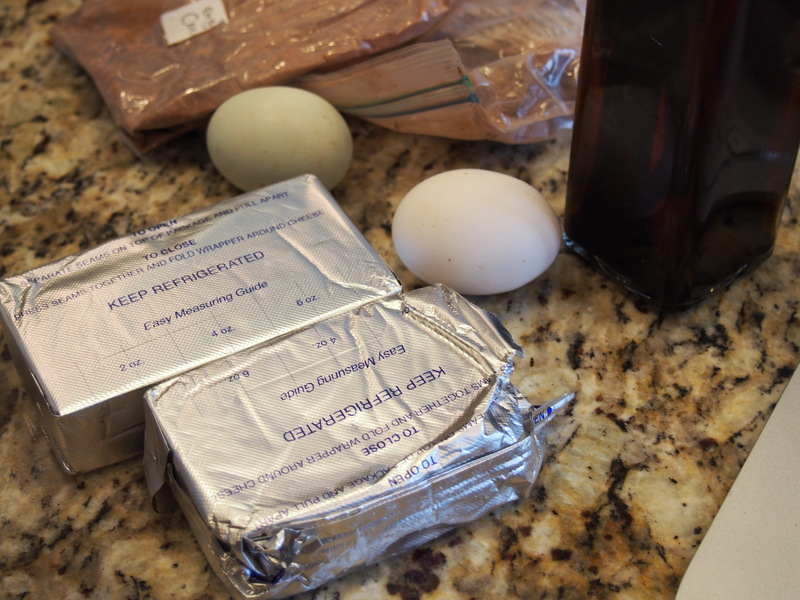 If you forget to take them out early, set the cream cheese and eggs in warm water while you make the crust. 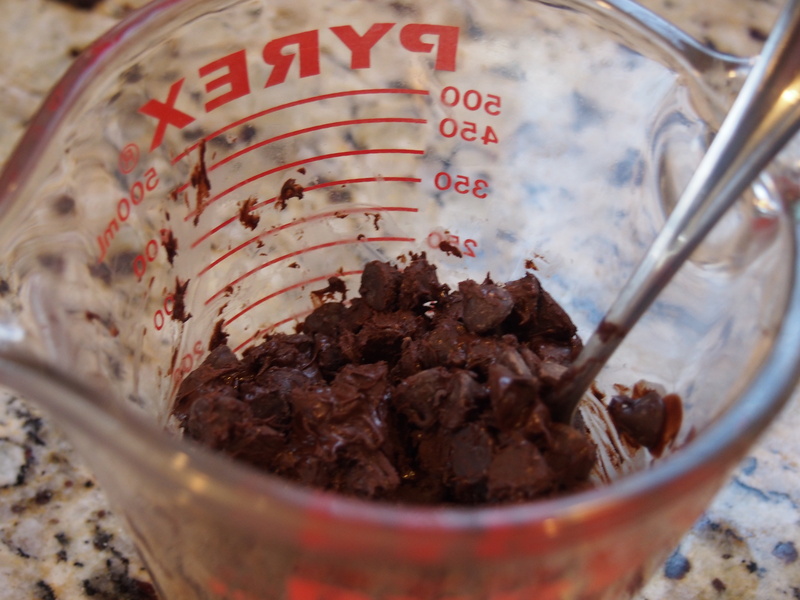 To melt the chocolate chips, I zap them in the microwave at 30% heat. Stir every minute. It will take two or three minutes. And the chips won’t seem entirely melted, but keep stirring until they all melt together. 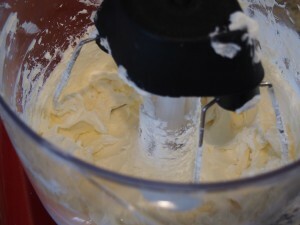 Whip up the cream cheese using your stand mixer. The cream cheese should be at room temp so you can get it nice and smooth and fluffy. Yes, fluffy. 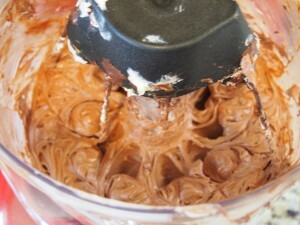 Then add your chocolate and other ingredients to the cream cheese. Mix just till combined. Don’t overmix at this point. Pour the batter into the prepared pan. The pan to the right is too full. The cake will puff up slightly when baking, and get stuck on the tin foil wrapping if it’s this full. So, take a little batter out, put it into a ramekin and bake it later for 15 minutes under pressure. No one ever has to know that the cook had an extra little treat. 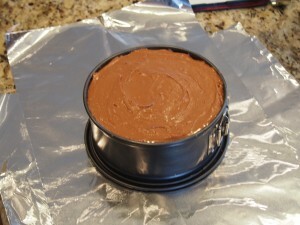 Wrap the pan up completely so no steam can get at the cake. To get the cake in and out of the pressure cooker, fold two long pieces of tin foil into fourths to make a little carrier to lift the cake. Add two cups of water to your pressure cooker and put the cake on a trivet to keep it out of the water. 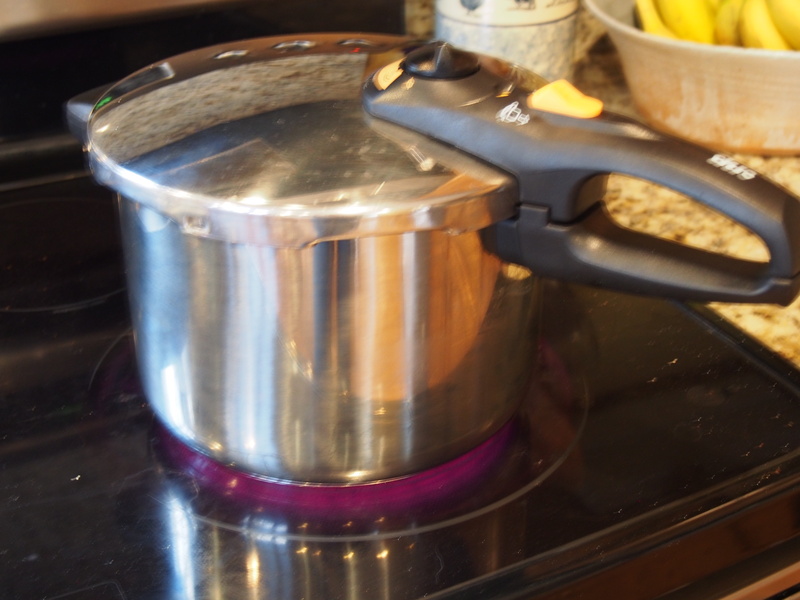 Bring the cooker to high pressure for 50 minutes. Let the pressure release naturally and then remove the cake, uncover and chill before serving. If any moisture collects on the top of the cake, just blot it up with a paper towel.